The air conditioning system switches between dual and simultaneous modes each time is pressed. Each temperature setting will be displayed on the multi-information display. 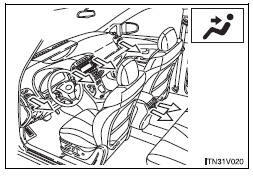 Dual mode: The temperature for the driver’s seat and front passenger’s seats can be set separately. can be used to adjust the temperature for all seats. In SYNC mode, only one temperature setting will be displayed on the multi-information display. Press “∧” (increase) or “∨” (decrease) on . The fan speed is shown on the display. 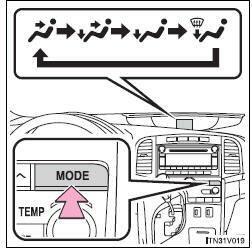 (7 levels) Pressing the button while in automatic mode will place the fan speed into manual mode. “AUTO” will turn off, and the fan speed setting will be displayed. The air outlet setting will remain in automatic mode. The air conditioning system display will go blank to indicate that the system is off. If the system is in outside air mode, some outlet airflow may still exist. The air outlets switch each time the button is pressed. 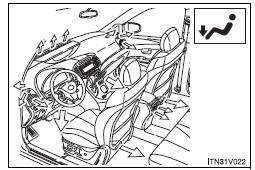 Pressing the button while in automatic mode will place the air outlets into manual mode. “AUTO” will turn off, and the air outlet setting will be displayed. The fan speed setting will remain in automatic mode. Mainly air flows to the feet. The mode switches between outside air mode (indicator off) and recirculated air mode (indicator on) each time the button is pressed.